The official countdown to Christmas has begun! Are you excited? How far have your preparations come? I had posted a couple of beauty gift guides for women over the last two weeks. If you have not seen them, you can take a look here and here. 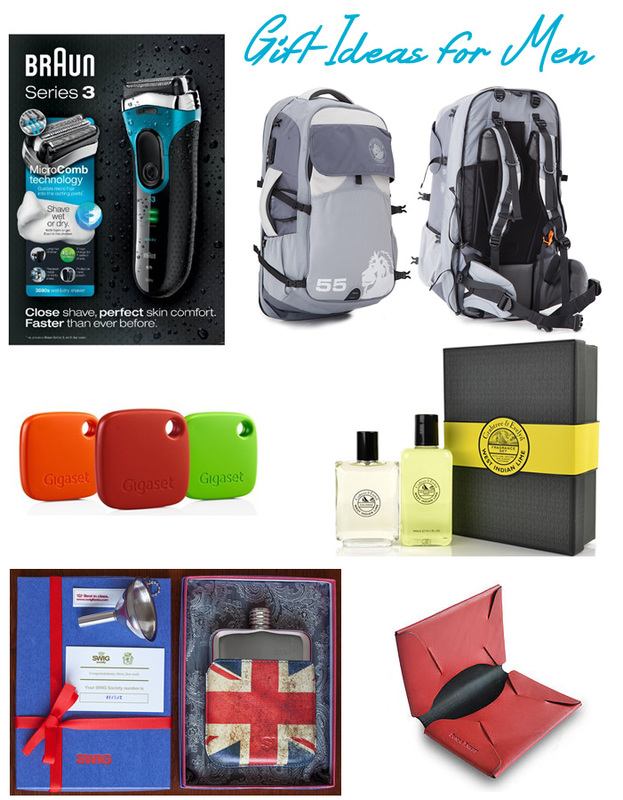 Today it is the turn of the men's gift guide featuring some products that are recommended by Mr.H and would make excellent Christmas gifts. Braun is Mr.H's top choice when it comes to grooming gadgets. He has used a number of their products over the years and loves them. Currently he is using the Braun Series 3 3080s model and loves it. This new shaver from Braun is a wet and dry shaver and uses the MicroComb technology to guide more hair into the cutting for a closer shave and greater skin comfort. The shaver scores well on ergonomics and contour adaptability as well. And it comes with a protective travel pouch too. This would make a very well recieved gift. This rucksack from Numinous would make an excellent gift for a travel lover. The backpack comprises of the Numinous layered security system which includes the Numinous Anti-Slash technology, TSA zip locks, anti-puncture zips and the very impressive Numinous Shield system which allows you to securely fix the rucksack to a dorm bed or fixed object. All these features offer maximum protection against anyone trying to gain access to your belongings. The rucksack is stylish, functional and very secure. You can read my detailed review here. Is there a forgetful member in your family? If yes, then the G-tag will make an apt gift for them. This clever little device makes use of Bluetooth technology to help track down important items such as keys, handbags or even your car. It does so by electronically syncing to a simple smartphone app and alerting you if you have left somewhere without the ‘tagged’ item. Featuring one of Crabtree & Evelyn's best selling mens' fragrances, the West Indian Lime Fragrance Set includes Hair & Body Wash 300ml and Cologne 100ml. The set features a tonic blend of lime, lemon, orange flower and vetiver - native to the British West Indies - with nutmeg, ginger, coriander, woody accord of juniper, cedar and sandalwood. The scent is refreshing, tropical and very fresh and has become one of Mr.H's go-to fragrance. You can read my review here. SWIG are a luxury hip flask brand. This executive gift set from SWIG includes one SWIG Hip Flask, a stainless steel funnel and an executive pouch. It comes beautifully gift packed and you can opt for an engraving as well. The quality of the product and the craftsmanship is excellent. The hip flask scores on all fronts - practicality, aesthetics and durability. The flask would make an excellent birthday or Christmas gift. You can read more here. Bond & Knight are independent British leather designers who specialise in handmade and bespoke leather goods. They were shortlisted and won the 2015 BTAA Fashion Accessory of the Year award recently. All their wallets are made using a single piece of folded leather, with no stitching or seams. Each wallet from Bond & Knight is completely unique but all of them are super soft, slim and yet super strong. You can personalise the wallet by having the receivers initials or a design or image printed onto the custom wallet. These high quality wallets would make an excellent gift for the man who has a penchant for personalised accessories. Read more here. Great ideas! I think my father would appreciate that bluetooth tagging set! Glad to have come across your blog. That G-tag sounds great. My husband loves gadgets but is also quite forgetful, so it'd be ideal for him!